Littlewoods, the British mail order company, is riffing on Shaun of the Dead this Christmas with the Littlweoods Christmas Walk. The commercial features a family who set out to get some fresh air on Christmas Day, dressed in style. The family walks through the streets proudly displaying winter jackets, boots, makeup, Beats headphones, Fitbit, scooter and lightsaber. The Shaun of the Dead reference comes as the family turn a corner and bump into another similarly attired family (cross reference Sean and Yvonne’s survivor gangs bumping into each other). The English politeness comes to the fore, with “Merry Christmas”, “hello” and “hi”. 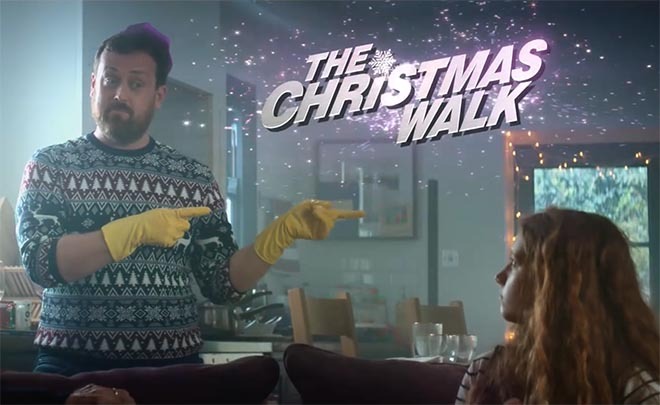 The Littlewoods Christmas Walk campaign was developed at St Lukes by creative director Julian Vizard, creatives Laura Stevens and Claire Wombwell, agency producers Jessie Middleton and Caspar Redgrave, senior planner Livia Stefanini, business manager Dominique Collins, account director Richard Hirson. Filming was shot by director Guy Manwaring via Sonny London with producer Amy Appleton. Editor was Mark Edinoff at Work Post. Sound was designed by Ben Reeves at Grand Central. Music is “Jungle” by X Ambassadors and Jamie N Commons.